We have a tradition in the RxView blog of starting each new year by asking if the year ahead will be “The Year of Drug Safety” or “The Year of Healthcare Technology”. We typically lay out a few thoughts on why the year ahead has the potential to be a big year. This year feels different. Maybe it’s the incredible bull market that has inflated our confidence or the fact that my colleague Jim Davis feels that it is a foregone conclusion that the Philadelphia Eagles will finally win the Super Bowl (sorry Jim, that’s ridiculous!). Or perhaps it’s the fact that our client roster keeps growing, Evidex keeps getting more valuable to our users every day, and key industry opinion leaders are confirming that our vision is THE path forward. Whatever the reason, I’m willing to be a bit bolder this year. 2018 WILL BE the year that the pharmacovigilance industry embraces the next generation of drug safety data, analytics, and software; What we call Pharmacovigilance 2.0. We got things rolling on our big year with our announcement on Tuesday that we’ve entered into a new partnership with Booz Allen Hamilton to include their Epidemico social monitoring data in our Evidex platform. This integration will provide our clients the opportunity to fit social monitoring into pharmacovigilance workflows by querying drug safety social insights from Booz Allen alongside FAERS, VigiBase, our clinical trial safety outcomes database, and other real-world data such as claims. 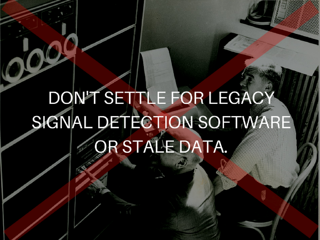 Leveraging Evidex’s best-in-class user interface and proprietary analytic capabilities across these disparate data sets will enable our users to detect and track signals in ways that have previously been impossible. And we’re just getting started. We have an aggressive product development road map of exciting developments coming in 2018, all geared towards making Pharmacovigilance 2.0 a reality. From platform extensions to new data integrations to new strategic partnerships, it’s all part of developing the next generation of drug safety tools that will make pharmacovigilance and epidemiology departments more efficient, more capable, and more valuable. Are you with us? Are you confident that 2018 is the year? If you’re attending the DIA Pharmacovigilance and Risk Management Strategies Conference next week, we’d like to hear your thoughts and show you our latest enhancements. Jim Davis and Bob Kyle will be staffing the Advera booth, taking notes in all of the sessions, and participating in the roundtables and discussions. And in addition to learning from speakers and talking shop with the attendees they will also be hosting a very special WINE TASTING on Monday evening featuring the 94-point rated pinot noir from Bruliam Wines (full disclosure and shameless plug – my wife makes this wine: www.bruliamwines.com). You can RSVP for the event here. P.S. Want to learn more about using social media for pharmacovigilance? Download the getting started guide here.